Everyone in your firm has left for the evening. You log in to Facebook, go to your best client’s page and read the day’s posts. Are you spying on your client? The answer is no. This isn’t spying because the information you’re reading was made available to the public by your client. However, following your clients and reading the information they make available on their social media accounts (also known as social media monitoring) can be very valuable. The same goes for monitoring your competitors. 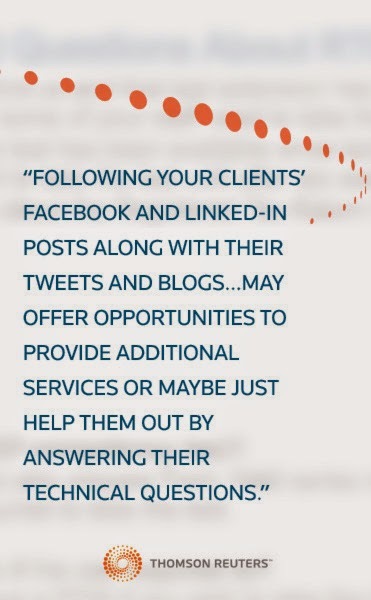 Following your clients’ Facebook and LinkedIn posts along with their tweets and blogs can tell you what they’re thinking, doing or concerned about. Monitoring your clients’ posts may offer opportunities to provide additional services or maybe just help them out by answering their technical questions. There are a multitude of social medial sites and that number grows daily, so don’t try to include them all. Select a limited number to follow at first,-perhaps three or four. Once you have had some experience monitoring your clients you can consider increasing the number of sites. Facebook is reported to have over 1.28 billion active monthly users. It should definitely be included in any social media monitoring program. LinkedIn says that they have 300 million active users. This is an excellent site for business and professional monitoring. Twitter says they have approximately 645 million active users who send over 500 million tweets of no more than 140 character text-based messages each day. YouTube is a video sharing website that purports to have more than 1 billion visitors each month worldwide. However, it is not enough just to join Facebook and Linked-In and create Twitter and YouTube accounts. Because of the massive amounts of data created by internet conversations you need to determine what your goals are as they relate to your social media monitoring. Then you should review the results of your monitoring to see if your goals are being met. Trying to manually accumulate and digest the volume of information generated from only four social media accounts would be like trying to drink from a fire hose. However, collecting the data is the easy part; the real challenge is analyzing the data and knowing how to use the results. Because of privacy issues, even the professional listening tools may not be able to find and access all social media conversations and include them in their analysis. Once you select a professional monitoring tool, identify the words and phrases that apply to your clients. Next you should identify your client’s key influencers. These are individuals who may be authorities in fields in which your firm provides services. Don’t post the same content from one site to another. Remember your clients may be on both sites. Control the urge to “market” to your clients. Monitor your clients’ posts and try to meet their needs. Create content that benefits your customers and that they will want to share with others. Focus on the needs of your customer and not on those of your firm. The benefits of social media monitoring can’t be overlooked. Engaging in social media monitoring is a required activity if you’re going to keep up with your competition. Brilliant Post!! I bookmarked this post. Fantastic post! The trend of using social media as an Accounting Professional is getting very popular these days. My uncle Dr. Aloke Ghosh is an online consultant. He is in expert in finance and accounts related work.